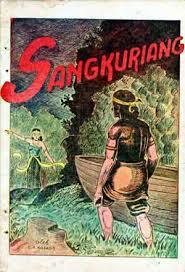 In ancient times , there was the story of a princess in West Java named Dayang Sumbi.Ia had a son , named Sangkuriang . The child was very fond of hunting . He was accompanied by Tumang hunting , dog pet palace . Sangkuriang not know that the dog is the incarnation of the god and father . One day Tumang not want to follow his orders to pursue prey . The dog then pursued into the woods . When he returned to the palace , Sangkuriang recounted the incident to his mother . Dayang Sumbi absurdly angry when I heard that story . He accidentally hit her head Sangkuriang with spoon in his hand . Sangkuriang injured . He was very disappointed and went mengembaraSetelah the incident , Dayang Sumbi very sorry for himself . He was always very diligent prayer and penance . At one point , the gods gave her a gift . He will be forever young and has a timeless beauty . After years of wandering , Sangkuriang eventually intends to return to his homeland . When he got there , the kingdom has changed completely . There he met a lovely girl , who was none other than Dayang Sumbi . Fascinated by her beauty then , Sangkuriang proposed. Therefore it is very handsome young man , Dayang Sumbi was very fascinated him . One day Sangkuriang asked permission to hunt . He asked Dayang Sumbi to spruce up the headband . What a surprise for Dayang Sumbi see the scar on the head of her future husband . The cut was exactly as his wounds have to go wander . After long noticed , turned out the young man's face is very similar to his face . He became very frightened . So then he sought to thwart the effort was making a proposal process . He filed two terms . First , he asked the young man to stem the Citarum river . And secondly , he asked Sangkuriang to make a big canoe to cross the river . The second condition that must be met before dawn . That night Sangkuriang doing penance . With his power he exert supernatural creatures to help finish the job . Dayang Sumbi was secretly peep the job . Once the work is almost complete , Dayang Sumbi ordered his troops to hold a red silk cloth to the east of the city . As witnessed in the eastern city of redness , Sangkuriang thought it was late morning . He also stopped work . He was very angry because it means he can not meet the requirements requested Dayang Sumbi . With his strength , he made his break through the dam . There was a great flood swept through the town . He was later kicked a large canoe made. The boat drifted and crashed into a mountain named " Tangkuban Perahu . "